Since 1987, Maria Candelas offers to her clients and friends a selected line of high end products, by the motto "creating beauty and comfort for your bathroom". In over 800 m2 of space Maria Candelas exhibits the most exclusive products in the national and international market, offering her wide experience in interior design to satisfy the highest expectations of all our clients. Projects all over the world carry the name and the prestige that Maria Candelas has earned with all her dedication and good will towards her clients. A highly qualified team of professionals in a variety of fields are the operating base of the company, directed, coordinated, and supervised by Maria Candelas herself. 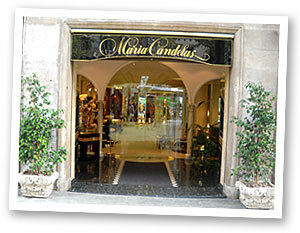 Entrance to María Candelas shop in Barcelona.